For Terry, some boat stats as at 03:30am 07Aug 08 (GMT). Sail set: Main, No1 and staysail. We are thinking of running a top 10 Most Useful Things On Board. We all agree that number 1 is blue roll. Used for mopping up spills (often by Peter), drying anything, napkins, cleaning, and the occasional surreptitious hankie. You cannot have too much on board (hopefully there will be enough remaining for the next leg!). Wildlife today consisted of the usual Storm Kestrels, a flock of Sea Gulls attracted by the off-cuts as Windy de-boning the lamb, and two pods of Whales. The first pod was feeding by circling blowing bubbles to confuse their prey, but they disappeared quickly as we approached. There was another bird seen, but unidentified. It seems strange dreams is infecting the crew. Peter reported dreaming that he was on deck, and as the boat rolled in reality, he dreamed that he was launched over the side. He was instantly awake desperately clutching for a handhold, but at least he did not scream like a girl. At time of writing -0310 local we are trundling along under sail and managing around five knots. We have had a look at the chart and reckon that we are around 2 days give or take from the first marker point from Greenland. After that it is on for a little bit more before we hit North and track up the coast 450 miles to our destination. We are making good progress and are looking forward to getting some sights of the fjords. Fog and ice are going to be the main dangers the further north we head and may slow us down considerably but we will just need to wait and see how it goes. Highlights of today are as has been said previously the team challenge which he were cruelly robbed on. Alan managed to give a good account of himself on the strongman challenge and was beaten by around 20 seconds on it, so close but not close enough on that. 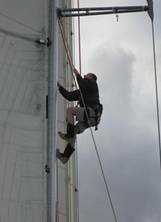 Neil also ended up going up the mast to rerig the pennant line.” It’s a wee bit higher than it looks……” We will take your word for it Neil. We will stick to the winching on that task thank you very much. Richard has also gleefully informed Alan that he had a tape of him snoring his head off whilst sleeping earlier on today. He hasn’t had any complaints from anyone yet though. They must be too polite to say!!! Further updates to follow…..Back blogging soon!!! !